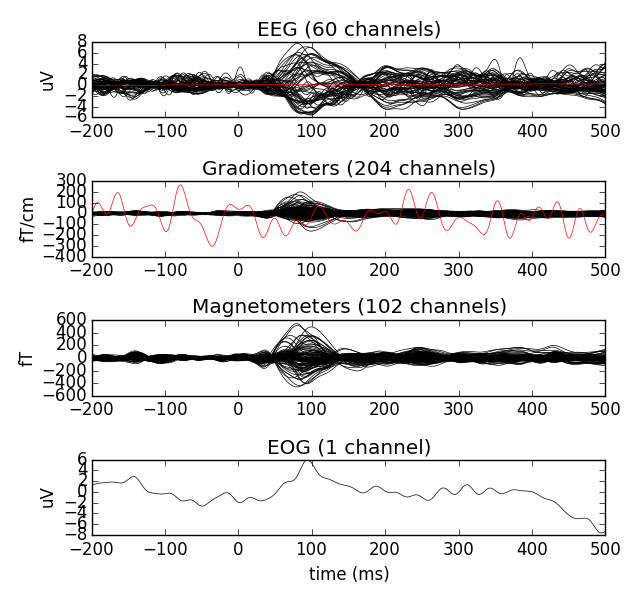 In this tutorial we focus on plotting functions of mne.Evoked. First we read the evoked object from a file. Check out Epoching and averaging (ERP/ERF) to get to this stage from raw data. Notice that evoked is a list of evoked instances. You can read only one of the categories by passing the argument condition to mne.read_evokeds(). To make things more simple for this tutorial, we read each instance to a variable. Let’s start with a simple one. We plot event related potentials / fields (ERP/ERF). The bad channels are not plotted by default. Here we explicitly set the exclude parameter to show the bad channels in red. All plotting functions of MNE-python return a handle to the figure instance. When we have the handle, we can customise the plots to our liking. All plotting functions of MNE-python return a handle to the figure instance. When we have the handle, we can customise the plots to our liking. For example, we can get rid of the empty space with a simple function call. Now let’s make it a bit fancier and only use MEG channels. Many of the MNE-functions include a picks parameter to include a selection of channels. picks is simply a list of channel indices that you can easily construct with mne.pick_types(). See also mne.pick_channels() and mne.pick_channels_regexp(). 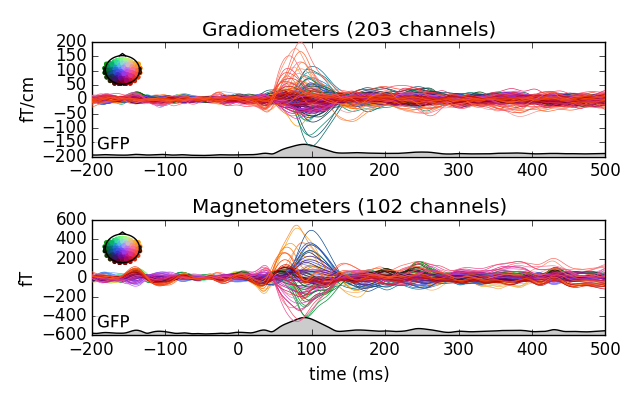 Using spatial_colors=True, the individual channel lines are color coded to show the sensor positions - specifically, the x, y, and z locations of the sensors are transformed into R, G and B values. Notice the legend on the left. The colors would suggest that there may be two separate sources for the signals. This wasn’t obvious from the first figure. Try painting the slopes with left mouse button. It should open a new window with topomaps (scalp plots) of the average over the painted area. There is also a function for drawing topomaps separately. By default the topomaps are drawn from evenly spread out points of time over the evoked data. We can also define the times ourselves. Or we can automatically select the peaks. 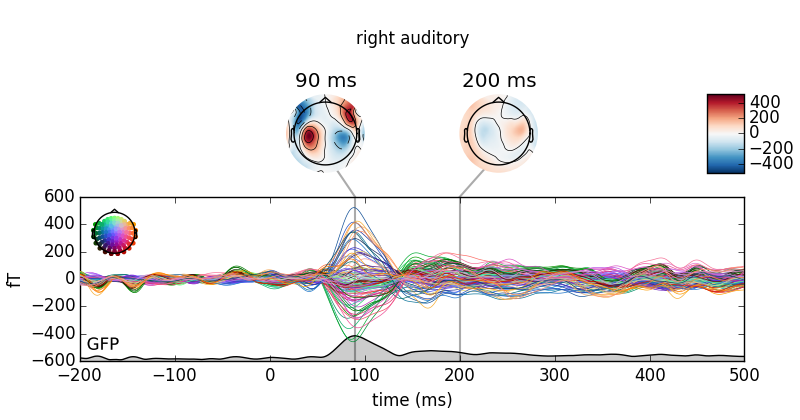 You can take a look at the documentation of mne.Evoked.plot_topomap() or simply write evoked_r_aud.plot_topomap? in your python console to see the different parameters you can pass to this function. Most of the plotting functions also accept axes parameter. With that, you can customise your plots even further. 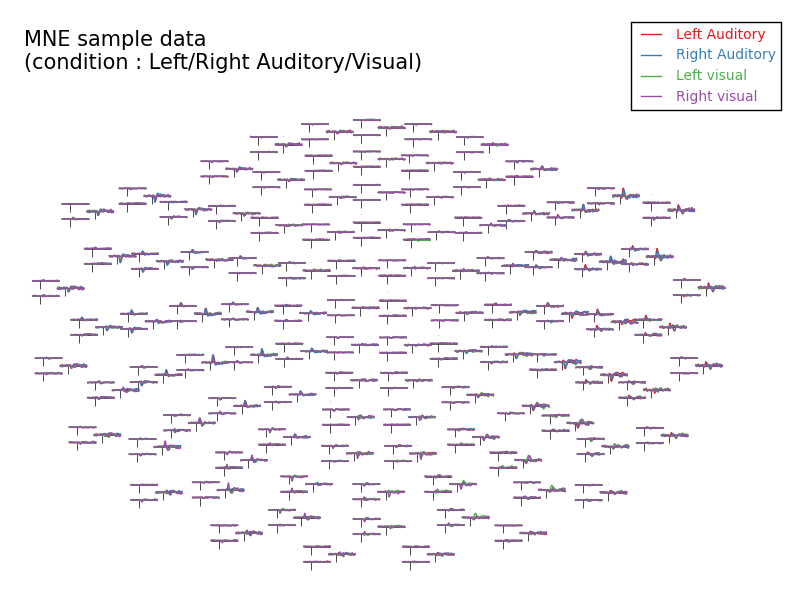 First we create a set of matplotlib axes in a single figure and plot all of our evoked categories next to each other. Notice that we created five axes, but had only four categories. The fifth axes was used for drawing the colorbar. You must provide room for it when you create this kind of custom plots or turn the colorbar off with colorbar=False. That’s what the warnings are trying to tell you. Also, we used show=False for the three first function calls. This prevents the showing of the figure prematurely. The behavior depends on the mode you are using for your python session. See http://matplotlib.org/users/shell.html for more information. 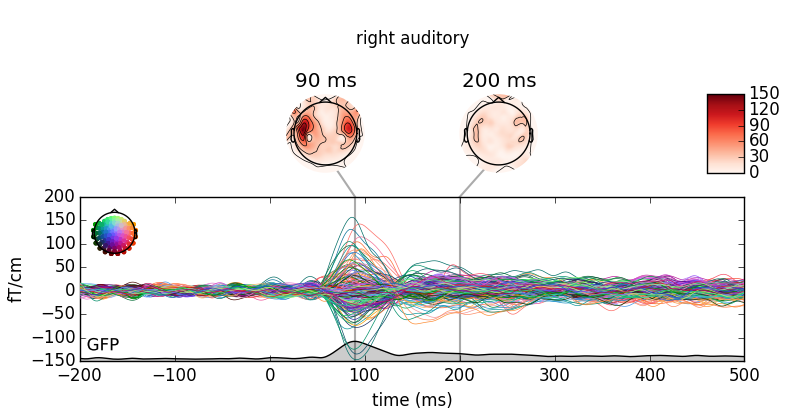 Sometimes, you may want to compare two or more conditions at a selection of sensors, or e.g. for the Global Field Power. For this, you can use the function mne.viz.plot_compare_evokeds(). The easiest way is to create a Python dictionary, where the keys are condition names and the values are mne.Evoked objects. 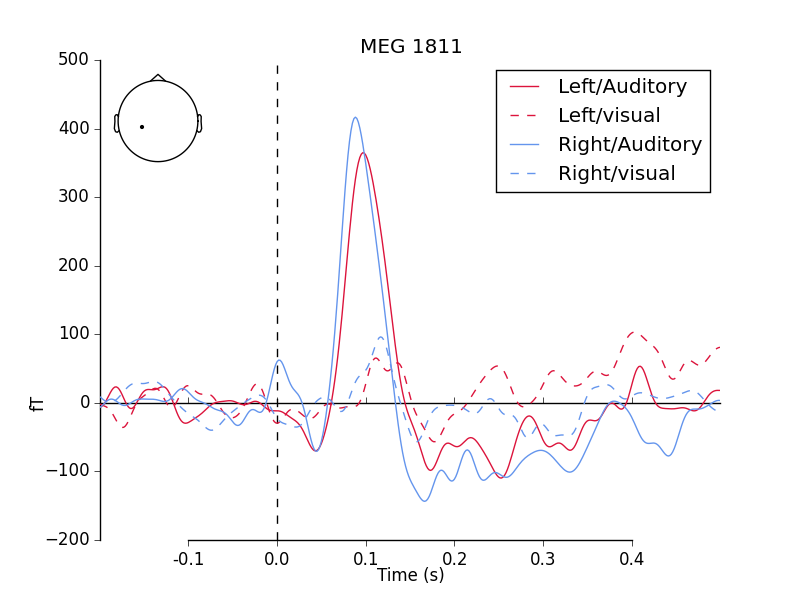 If you provide lists of mne.Evoked objects, such as those for multiple subjects, the grand average is plotted, along with a confidence interval band - this can be used to contrast conditions for a whole experiment. First, we load in the evoked objects into a dictionary, setting the keys to ‘/’-separated tags (as we can do with event_ids for epochs). Then, we plot with mne.viz.plot_compare_evokeds(). The plot is styled with dictionary arguments, again using “/”-separated tags. 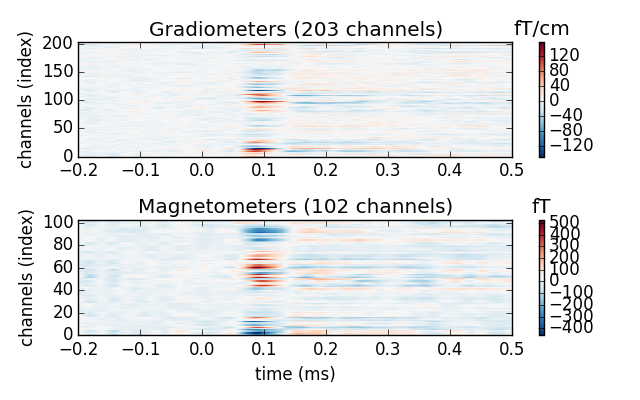 We plot a MEG channel with a strong auditory response. We can also plot the activations as images. The time runs along the x-axis and the channels along the y-axis. The amplitudes are color coded so that the amplitudes from negative to positive translates to shift from blue to red. White means zero amplitude. You can use the cmap parameter to define the color map yourself. 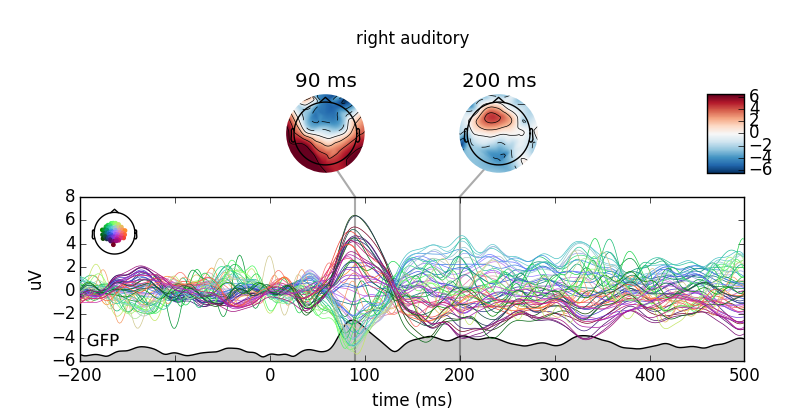 The accepted values include all matplotlib colormaps. Finally we plot the sensor data as a topographical view. 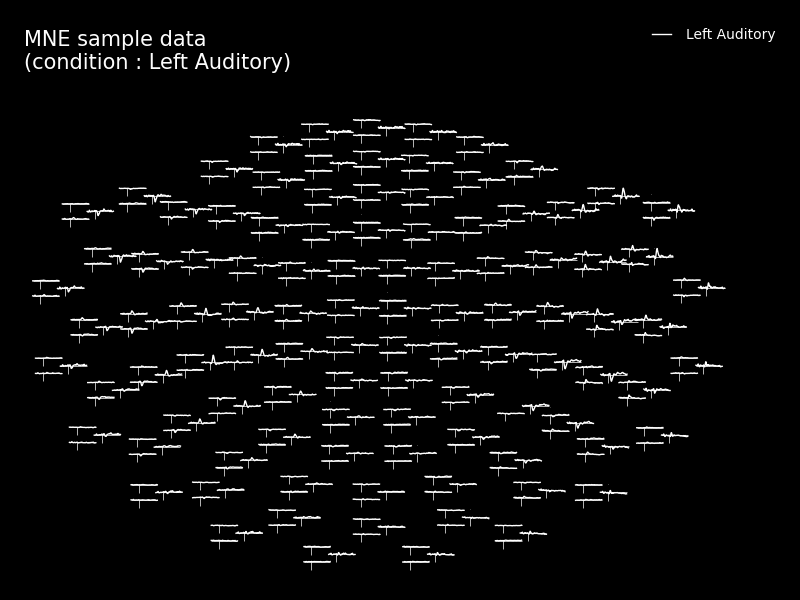 In the simple case we plot only left auditory responses, and then we plot them all in the same figure for comparison. Click on the individual plots to open them bigger. 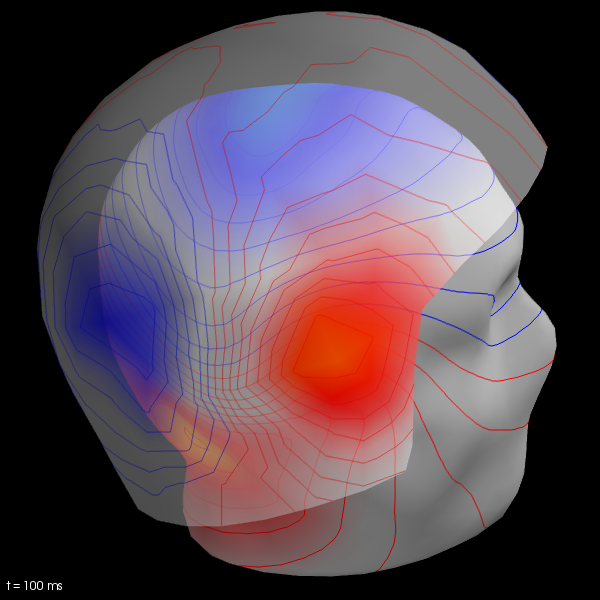 We now compute the field maps to project MEG and EEG data to MEG helmet and scalp surface. To do this we’ll need coregistration information. See Head model and forward computation for more details. Here we just illustrate usage. If trans_fname is set to None then only MEG estimates can be visualized.